Chapman’s goldenrod, Solidago odora var. chapmanii, occurs naturally in dry open woods, sandhills, and pinelands. Goldenrod is in the Asteraceae, or aster family. Two varieties of Solidago odora occur in Central Florida var. chapmanii and var. odora (Sweet goldenrod). Sweet goldenrod produces an anise scent when the leaves are crushed and Chapman’s goldenrod does not. Chapman’s goldenrod is a perennial wildflower reaching 4 ½ feet in height at maturity, and approximately 2 to 3 feet in width. 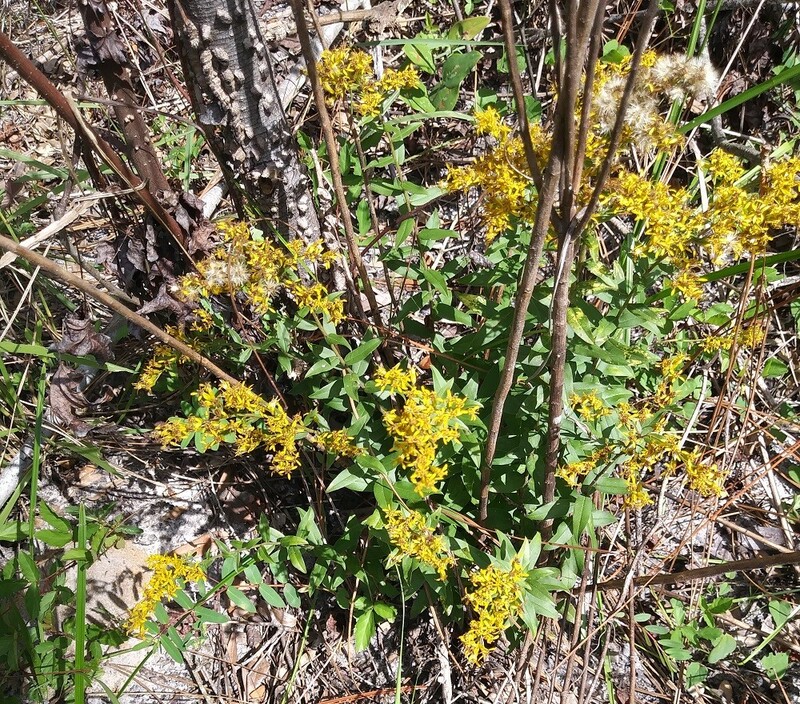 It is a clump forming type of goldenrod and does not spread by rhizomes as do many other goldenrods. It is also one of the few that prefer dry sites. I find these characteristics quite appealing in the home landscape because this goldenrod will not take over a flowerbed or require watering once established. Its leaves are alternate, oblong to elliptic in shape, and do not have stalks (sessile). The leaf margins are entire and the edges are rolled backward towards the underside (revolute). The yellow flower heads appear in the late summer and fall and consist of many small florets. The flowers attract an incredible variety of insect pollinators including bees, wasps, love bugs, and small butterflies such as skippers and hairstreaks. Songbirds such as goldfinches and sparrows eat the seeds, and meadow mice and deer eat the foliage and flowers. 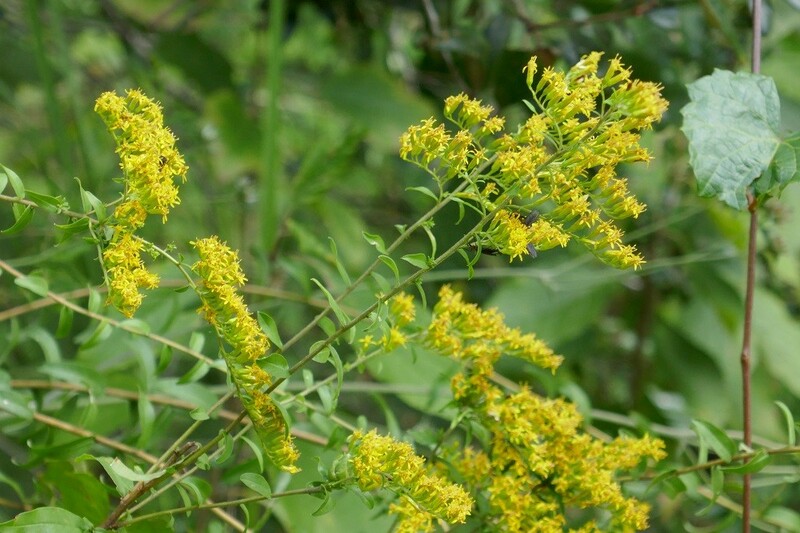 Many people incorrectly believe that goldenrod is responsible for hay fever, however, since goldenrod is insect pollinated, rather than wind pollinated, it is not the culprit. Wind pollinated plants such as ragweed and oak are likely the cause of hay fever attacks. Propagation can be achieved with seeds, however, I find it much easier to use transplants. Any size transplant will survive if immediately put into potting soil or directly into the ground and kept regularly watered until established. Also, remove any blooms when transplanting to help reduce shock. In the home landscape Chapman’s goldenrod prefers average moisture with dappled sunlight. Once established it is drought tolerant. It will grow in very shady areas, but does not flower as well, and may become lanky. It is quite nice in the landscape because it provides beautiful clumps of greenery throughout the year and then in the fall bright yellow flowers burst open at the tops of the green clumps. The best color effect is produced when it is planted in mass. It is best to mulch with leaves or pine needles as many wildflowers are damaged by the excessive moisture retention of heavy mulches such as Melaleuca, cypress or pine bark. Buy Chapman’s goldenrod starter plants here!